Mickey Mouse needs no introduction. His video games, however, do. Back in the late 80s and early 90s, Disney loaned out their beloved character to various video game studios, such as Capcom. Numerous games of varying quality (though generally that quality was fairly high) were produced for the major consoles at the time. For the Sega Genesis, Disney let Sega develop a few games featuring the mouse. Those games were Castle of Illusion Starring Mickey Mouse and its sequel, World of Illusion Starring Mickey Mouse and Donald Duck. I had World of Illusion. It was one of the first video games I owned. And it terrified me. Even the clouds try to kill you. 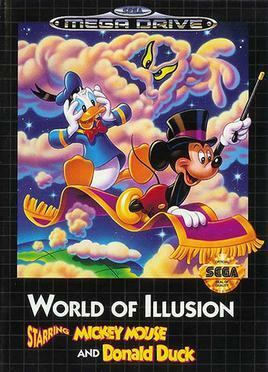 World of Illusion starts with Mickey and Donald preparing for a magic show, when they find a mysterious box. 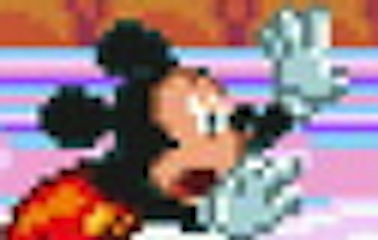 While examining the box, Mickey and Donald are teleported away to the Alice In Wonderland-esque World of Illusion, with nothing but their magic capes to defend themselves. Together (or separate, if you’re playing Single-Player), Mickey and Donald must escape this world in time to perform their magic show. Sounds pretty innocent, right? As with everything, the devil is in the details. When you start the game, the first thing you notice is the music. It’s not bad, not really. But it doesn’t seem playful, like what you’d expect from a game based on cartoon characters. It starts out kind of light, but grows heavy with an almost organ-like sound. This sound permeates through the entire game, occasionally letting up, but always there in the background. Once again, that does not mean the sound is bad. Take a listen. Not exactly charming cartoon music, is it? Sounds like something more appropriate to stained glass than cartoon. The graphics in the game are top-notch, though. Especially on Mickey and Donald—the characters animate fluidly and have lots of detail. But, like everything in this game, something seems off. For example, the characters have a “run” button. And pressing that button has them move faster, but also move with terrified looks on their faces. What’s got Mickey so scared? Well, the enemies. They all look something out of Alice in Wonderland, and you will actually find enemies that resemble the Mad Hatter and the deck of cards from the Queen of Hearts’ Court. These enemies have weapons. You have a cape. Your only means of attack is to swish your cape, which will turn the enemies into something harmless (flowers, butterflies, etc), but only if you let the enemy get close enough to do it. If you only hit the enemy with the edge of the cape, they freeze and flash for a few moments, before going back to normal. So, you have to let the enemies with pointy objects get really to hurting Mickey and Donald before you can defend yourself. I mentioned above that this game terrified me when I played it as a child. The part that always got to me was the first boss. A giant spider. You look at him, and he looks rather cartoony and silly. But, you have to place yourself in a child’s shoes. Here you are, a young boy, ready to laugh with Mickey and Donald. Instead, you have bug-men with spears chasing you, plants that want to eat you, and spiders dangling from the ceiling. To get to the boss, you have to navigate a fairly tricky platforming bit where the floor will break under you, all the while listening to strange music. Then, when you think you’re done, you have to deal with a giant spider. That is not to say that this is a bad game, or that I don’t like it. Quite the opposite in fact. The game is very good, not too challenging (outside of bottomless pits, but Mickey and Donald can take a lot of hits before death), the animations are great, and the level design is really clever and bizarre. It truly feels like you’re exploring a Wonderland. But like Wonderland, there is always something a bit menacing about it. Something a bit off-putting. Like you can’t quite trust what you see. Like everything is out to get you.